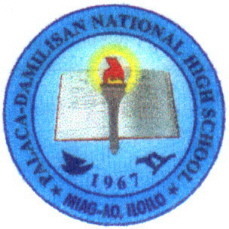 Palaca-Damilisan National High School (formerly known as Palaca-Damilisan Barangay High School), was founded in August 1967 through the creation of the Barrio Charter. The school is situated along the national highway going to the Province of Antique. It is four (4) kilometers from the poblacion of Miagao and five (5) kilometers to the next barangay high school. The students come from the Miagao West Central Elementary School and from the different barangays comprising the elementary schools in the rural areas. It started its operation with two full-time teachers and part-time teachers under the supervision of the elementary school principal who acted as the Assistant Principal of the Secondary level. The school grew bigger as the years went on and in 1983-1984, there was an enrolment of 441 students with two sections per year level. A Secondary School Head Teacher was created with eight (8) full-time and two (2) part-time teachers handling the classes. In 1988, all schools in the Philippines were nationalized. In 1993, the nationalization was fully implemented. In the same year, the school was a recipient of SEDP Building Package worth Php 5 Million. The package consists of a two-storey building, a library building, a T.H.E. building, pieces of furniture, laboratory apparatuses and shop tools. The school is envisioned to be the center of excellence that would promote the total development of the young individuals enhancing their mental, spiritual, social, moral, physical and emotional attributes complimenting each other for the total development of their personality. It has a mission to deliver quality education, in the local touch and world class graduates. In school year 1995-1996 and 1996-1997, the school was chosen as the second "Most Effective Secondary School" in the First Congressional Level.